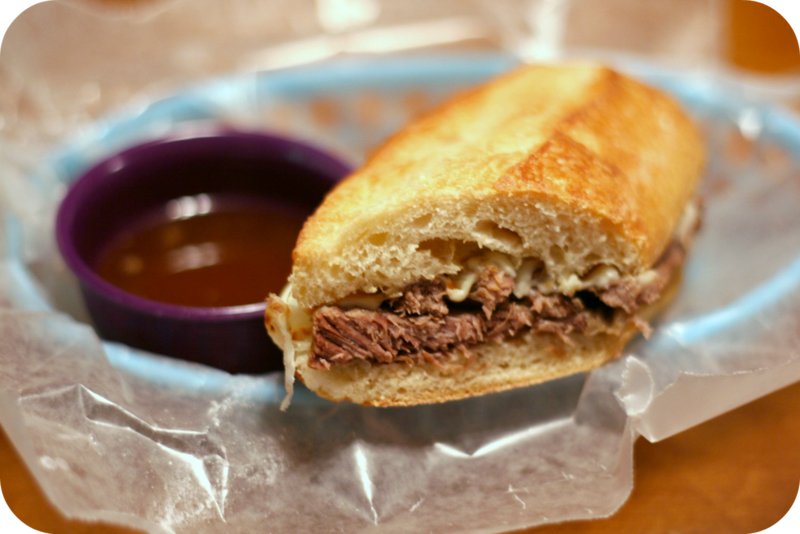 Rob and I love French Dip sandwiches, and I'll be honest, most of the time I cheat and use Roast Beef from the deli. While always good, I realized that it's not the most economical way to make this, nor is it as good as a real French Dip should be. For a few more dollars I could buy a roast from the butcher to make, and get significantly more meat; which will produce leftovers, or allow me to feed more people! In addition to it being more economical - it's just plain better! In reality, I've always just been making grilled roast beef sandwiches. However, when I decided to look up a recipe for a legit French Dip, I came across this one from Confections of a Foodie Bride. I've always loved Shawnda's blog, and had great success with recipes she's posted, so I knew this would be a good one to try. A bonus is that it's a crock-pot meal. I am trying to make a point of using my crock-pot more often for time-saving purposes, but I admit it's sometimes a challenge to find recipes that have been made in the crock-pot that don't include a lot of prepackaged foods. I am not opposed to prepackaged, but I do try to avoid when possible. This recipe doesn't use prepackaged, another bonus! And, speaking of bonuses to this recipe - it comes together really quickly! I can put it together within a matter of minutes in the morning, plop it in the crock-pot, set the timer and be out the door! When I get home from work it's on warm waiting for me, and I can play with my little guy instead of work on dinner! My only complaint is that my son's current favorite thing to do is try to open the broiler drawer - which clearly is not safe, especially while in use. Thankfully he's usually pretty content in the highchair with some snacks while I take the 10 minutes to slice the bread, assemble the sandwiches, and melt the cheese! These sandwiches were amazing, and I'm so glad I broke out of my rut of just using deli meat! The meat was tender and flavorful, and who doesn't love melted cheese?! I do recommend a good quality bread. I used French from Panera Bread, but any hard crusted bread will work well. I love to use Ciabatta for most sandwiches! Slice the onion into 1/4-inch rounds, keeping intact. Place them in the bottom of the crock-pot. Add broth, water, soy sauce, Worcestershire sauce, mustard and garlic to the crock-pot. Salt and pepper both sides of the roast and place on top of the onions. Cook on low for 6-7 hours until beef if fall-apart tender. Transfer the roast to a cutting board and shred using two forks. Remove the onions and set aside. Strain the juice to skim the fat/oil that collects on top. Return the roast, juice and onions to the crockpot on the "warm" setting for up to an hour before serving. Heat the broiler. Place the split rolls on a lined baking sheet and toast for 1 minute or just until the bread begins to brown. Remove the tops from the pan. Scoop the beef onto the bottom of the rolls and top with cheese. Return to the oven just until the cheese is melted. Top with sandwich halves, and serve with small bowls of jus.